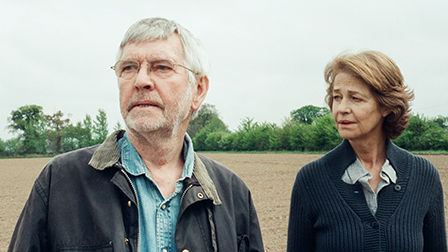 In Andrew Haigh's relationship drama “45 Years” (2015), Kate (Charlotte Rampling) and Geoff (Tom Courtenay) Mercer while away their days in a pleasant if uneventful retirement in rural Norfolk; their main project is the preparation for their impending forty-fifth anniversary party with friends and family eager to help the happy couple celebrate their long journey together. It's quickly obvious that Kate is the calm, pragmatic planner in the marriage, but she didn't plan for the arrival of a letter that informs Geoff of a shocking discovery related to his past. His already eccentric behavior becomes increasingly erratic, and Kate's determined effort to unearth the reasons behind his deterioration will bring explanations, but not solace. On multiple occasions I wondered, “What in the hell is she so upset about?” The chorus of critical hosannas from around the world (at 97% on the Holy Tomatometer, “45 Years” was one of the most praised films of 2015) suggests I must consider the possibility that I flat out didn't get it, which has been known to happen from time to time. Perhaps it's just because I tend to be a lot less interested in dialogue-heavy, two-hander dramas than most viewers. A whole, whole lot less. Way less. However, I liked Haigh's previous film. “Weekend” (2011), also released by Criterion, so it'll just have to remain a mystery. It's not a mystery I'm terribly motivated to solve. I'll encourage you instead to check out the film's more positive reviews. You won't find any shortage of them. The film is presented in its original 1.85:1 aspect ratio. As you would expect for such a recent film, the high-def transfer is practically immaculate, with razor-sharp image quality, and warm but subtle colors. No complaints at all on this front. The DTS-HD Master Audio 5.1 surround track doesn't have to deal with much beyond dialogue so don't expect any revelations on the surround front. But it's a crisp, distortion-free mix which more than does the job. Optional English subtitles support the English audio. 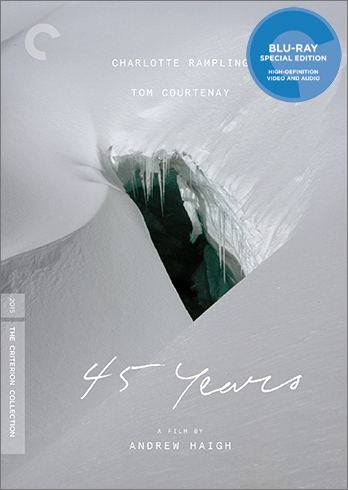 Criterion has gone a bit light on the supplements, but what's here is good. The film is accompanied by a 2015 commentary track (“courtesy of Curzon Artificial Eye”) featuring director Andrew Haigh and producer Tristan Goligher. “The Making of '45 Years'” (2016, 36 min.) combines interview with cast (Rampling, Courtenay) and crew (Haigh, Goligher, editor Jonathan Alberts, cinematographer Lol Crawley). Haigh adapted the film from author David Constantine's (very) short story “In Another Country.” In an interview (13 min. ), Constantine talks about his story and his reaction to the film version. A Trailer (2 min.) rounds out the extras. The slim fold-out insert booklet features an essay by critic Ella Taylor. I'm confident that you'll like the film more than I did. And even if you don't, check out Haigh's “Weekend” which was also released by the Criterion Collection.